Over the holidays, I received a lot of books (and Amazon gift certificates). Of the dozen or so books, I started off reading the Bob Mould autobiography since Lori wants to read it too. After that I've started digging into the more "serious" books. 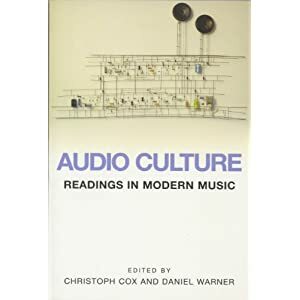 I've been particularly interested in Audio Cultures: Readings in Modern Music edited by Christoph Cox and Daniel Warner. The first section includes a number of essays that deal with the concepts of silence and noise in relation to modern music but also in everyday modes of listening. In general, there is no such thing as silence, and noise would be defined as the interference in receiving signals. Noise is what we don't want to hear in order to better hear what we want to. This applies not only applies to music but to everyday sounds. There is also visual noise which gets in the way of properly receiving visual signals. The senses, smell and taste are not immune from noise either. I have always been fascinated by art that uses for it signal what is generally referred to as noise. In everything, (whether visual art, music, food, wine) I seek a balance of signal, noise and silence. Though I typically downplay intentionality in assessing art, it certainly does come into play. That said, the final product/assessment is made by the receiver. Results will vary.